UPDATE: So I guess I initially misread this, it appears to be an evening of DJ SETS ONLY. 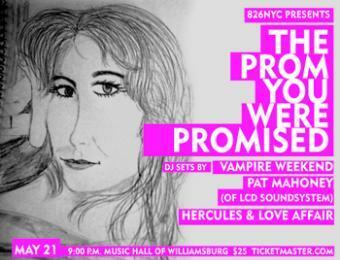 Hey, it looks like Vampire Weekend are playing DJing yet another small club gig (though not as small as Joe’s Pub this time) on May 21 at the Music Hall of Williamsburg. The star studded lineup, which is a benefit for the erstwhile 826NYC, also includes Brooklyn disco outfit Hercules and Love Affair and Pat Mahoney of LCD Soundsystem. Tickets for this eclectic show go on sale April 16 (Thursday) at noon. If you’re not on at noon, don’t worry, I don’t expect it to sell out very fast.